Last Saturday, while Hurricane Irene blew in New England, the Patriots blew in Detroit. In the wake of the 34-10 dungfest, the Foxboro faithful have to hope for some more fight from their team once the real thing gets going. Low Pressure System: After getting after Tampa Bay’s offense the previous scrimmage, the Patriots’ much-vaunted pressure got tamped down by a little Detroit game planning. Players like Andre Carter and Mark Anderson, who had made themselves at home in the Bucs’ backfield, never got to the Lions. At one point, a clear-path sack by Anderson devolved into a big gain on an ensuing QB scramble. Miserable night. Just awful. Let’s hope the pass rush has a little more success against the Giants. Everything But The Kitchen ’Cinco: Okay, sure, receiver Chad Ochocinco has a lot to learn in New England’s notoriously difficult offense. But is that an excuse for his dropped pass last Saturday? Here’s another issue we have: the Pats Free Agent JG Scale. The spectrum of free agent receivers runs from Joey Galloway (poor) to Jabar Gaffney (great). Galloway signed in March of 2009, went through every camp, yet never picked up the offense and got cut by October. Gaffney, on the other hand, was signed in October 2006 and after a month became a consistent contributor to the offense. Players seem to pick up this offense, or not. Let’s hope Ochocinco falls in the former category. Fare Thee Welker: And Wes Welker got hurt making a tackle after an interception? Ugh. Why did that game even happen? Low Price: A disappointing showing for second-year receiver Taylor Price, who couldn’t come up with a completion. We’re rooting for the young receivers, but neither Price nor Brandon Tate had much to show on Saturday. A Hidden Julian: Looks like Julian Edelman came to play, getting consistent, tough yardage on punt returns. He also caught a short pass and made a move that left defenders wallowing in tar. One bright note from a dim night. Out With The Old, Injury New: Tough to see young guys like Dane Fletcher, Jermaine Cunningham, Stevan Ridley and Shane Vereen on the bench due to various aches and pains. Interesting to see who suits up for Thursday and for how long. Hold The Mayo: Yeah, I know, clever and original. 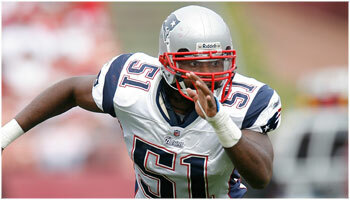 Dear Coach Belichick, please don’t play linebacker Jerod Mayo or any other starters in this game. Despite last week’s clusterhump, please give the starters a rest and let the rookies and backups show what they can do. Thursday night we’ll see the last game that means nothing; but, after Saturday’s mess, maybe it will have some significance.